heat oven to 450F and roast the tenderloin until the thermometer says it's done (30-40 min). 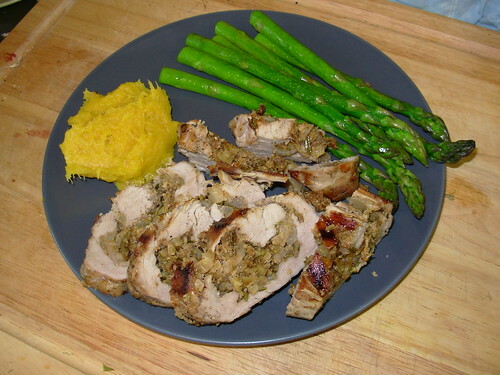 Served with the pork tenderloin are mashed acorn squash (I just put a small acorn squash in the same pan as the pork and they roasted together, then I mashed it with a fork) and steamed asparagus. Really yummy! I just took six boneless pork loin centre chops, laid then in the bottom of an oiled roasting pan, and spooned the fennel mix on top. Covered and baked for 40 min!